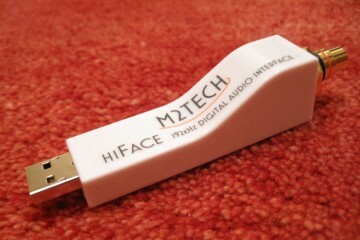 The original HiFace offered an affordable and simple solution to converting USB to spdif audio. The new Evo does not only that, but it also offers its output signals in all audio formats known to man. But the biggest thing is that it sounds a lot better. Make that A LOT. I won’t get into the technical details too much here as it is the sound that counts. Basically, the insides are comparable to those of the original HiFace but instead of taking its power from the USB bus, the circuitry inside the interface now has a connection for an outboard power supply (not supplied) and on the inside uses dedicated lines to several circuits. The USB power is not used anymore at all. The outside power supply means that you can experiment with different supplies but also with batteries. The HiFace EVO has all connectivity known to man and I’m not exaggerating! 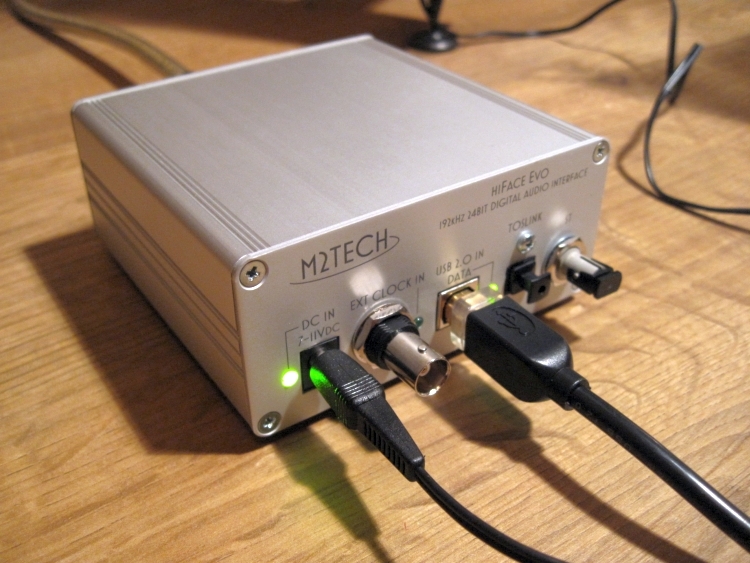 There’s AES/EBU, Cinch, BNC, Toslink, ST glass (Wadia or Levinson users take note!) and even I2S. 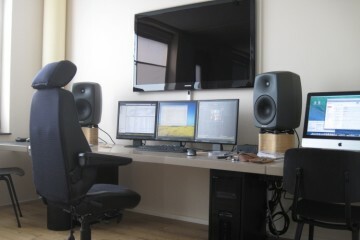 The added bonus is that you can connect multiple devices simultaneously such as in my case, the living room and the secondary room. In addition, it is now possible to supply an outboard clock signal by means of a master clock. I used it with a 13v Theta power supply (nothing more than a regular plugin adapter, no magic inside) and experimented with batteries later. I also experimented with Mac, but more on that later. 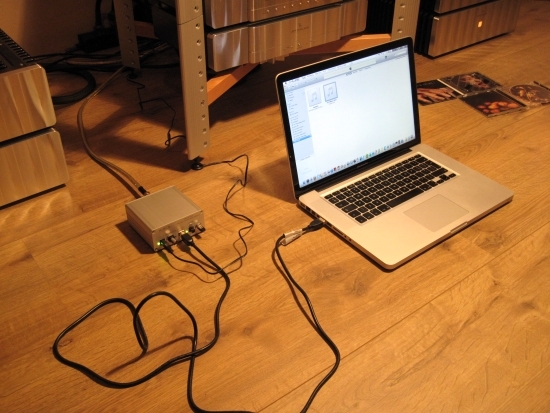 The first test was carried out in combination with my main Windows XP computer, via a long RG59 coax cable, straight into my Levinson no.360S DAC. For USB connection I used a standard cable. Even though I’m sure that here too, cables can matter, I have made no comparisons yet. As playback application lately I’ve been using iTunes in combination with a handy program called Virtual Cable that provides a direct connection between playback application and soundcard (kernel streaming) for iTunes which is otherwise routed through kmix and normally doesn’t sound very good on Windows. For more information about this see the “Optimising iTunes for Windows” article elsewhere on this site. I admit it: with the original HiFace, I had preconceptions. It’s just that thus far, external USB interfaces have not done it for me. Surely it would sound thinner than my trusty EMU PCI soundcard I figured, and it did. The HiFace was fast, impressive, detailed, open and airy but ultimately I found it less engaging than the EMU. The Evo, however, is a different story: even during the first track, it was already clear that this was a different animal. The EVO’s sound is big, airy, fluid, fast, rhythmic, focused and very open yet there is no clinical quality to the sound at all. The sound just captivated me and made my foot tap. It was certainly very engaging but I felt that the EMU still had more balls so I swapped back. Indeed, the EMU has a more solid, grounded sound but for the first time I wasn’t quite sure whether I liked it more. So the EMU had a beefier sound which helps my Magnepans from sounding too thin with computer audio but otherwise, the EVO was clearly better. The EVO had a wider soundstage while managing at once to even sound more focused than the EMU. In addition, it was now painfully clear that my dear EMU was somewhat congested in the higher treble as well as clearly being less intricately and finely detailed. This last aspect was already made apparent during earlier comparisons, for example with the Weiss, but there was always a tradeoff. Not so here. The bass is slightly less full but it is very deep and smooth. It just sounds right. This was a real surprise! I was prepared to see a situation where one was better at this aspect and the other better at another aspect but here was a situation where the Evo actually was better in almost all aspects. Using a 9v battery instead of a wall wart power supply makes for a transformation in sound. I know that many people might not believe in this but I swear it’s true. I do have some earlier knowledge gained from the other battery powered units that I use, such as the Jeff Rowland BPSes for the pre- and power amps. What the BPSses do for the Rowlands, the 9v Battery does for the EVO, to some extent. Sound becomes more free-flowing, less aggressive, more fluid and organic. But like the BPSses, the EVO with battery also tends to slow the sound down a bit and takes a considerable amount of bass slam away. And it is this latter aspect that makes me not want to use batteries with the EVO even though for certain music styles the battery improves the music in such a way that you actually don’t feel like listening to a computer anymore at all. Now my system already has BPS power for the preamp and power amps and as with all matters audio, you can simply take matters too far. Perhaps if a given audio system is very open and perhaps even a bit clinical, and you can accommodate the loss in bass power, then the battery power for the EVO might be a good thing. For this part of the review, I used the EVO with a 13v Theta power supply (nothing more than a regular plugin adapter, no magic inside) and experimented with batteries later. This time the long RG59 cable was not used. Instead, the MacBook Pro was positioned right next to the DAC and connected by a Wireworld Gold Starlight III digital coax cable, straight into my Levinson no.360S DAC. For this test, I copied a few tracks from CD to AIFF straight into iTunes and compared them to the same CD’s playing in my Levinson no.390S CD player. During the test, I swapped the analog interconnect cables between DAC and CD player to avoid differences in cables or inputs on the preamp. For the second time, I was surprised by the sound quality of the EVO. Even with the MacBook Pro as a source, it was very engaging. (don’t get me wrong: as a computer it is excellent, but it is still a laptop, complete with inherent lower sound quality than a big tower computer). The first track I played was from a Pat Metheny CD, together with Ana Maria Jopek. This track was immensely enjoyable via the Mac. It was so engaging that I almost forgot that I was doing a test but as soon as I realized that again, I swapped sources and listened to the cd, spinning in the Levinson. Mmmmmmm. Could it be that it was actually less enjoyable? This was unexpected. The CD sounded fuller and more relaxed, but also less open and explicit. I was quick to start comparing the next cd, from George Duke. This time the situation was reversed in that the Mac sounded nice but the CD added more realness and a more analog quality to it. It seems that the first track was helped by the more explicit sound of the EVO while the second was not. 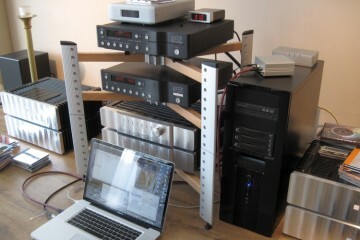 After these first impressions I listened to many more tracks from the Mac and have to conclude that with the addition of the Evo, the Macbook certainly sounds very impressive and with certain tracks even simply magical but overall still cannot compete with a tower PC – as long as that tower PC also makes use of the EVO that is! Here the results were the same as when used in the PC setup: a mellowing of tone, more freedom from digital-ness and with some music very entertaining. But the loss of attack and bass power made for a more boring delivery. It didn’t grab you anymore. Even more, than in the PC setup, the battery did not match so well. Perhaps because the MacBook already sounded thinner than the big PC. After I obtained a 25 meter long ST glass cable, I compared it to the standard Belden RG59 coaxial cable and found out that ST glass is superior. At 25 meters, RG59 tends to add some artificial sharpness, attack, and coarseness to the sound, compared to a 1-meter cable of the same make. The good news is that this kind of difference theoretically doesn’t exist with ST Glass. This standard is devised for application in telecom in lengths of hundreds of meters. Of course you do need a DA converter that has the appropriate input (the older Levinsons, Krells and Wadias do) but then there are only upsides. The cable is thin, costs almost no money (I paid less than 40 dollars for 25 meters) and has no losses. The ST glass connection made the HiFace even better. It now sounds more like the KingRex UC192 (which is superfluid and silky) buta with better slam and bigger, deeper bass. Read about digital cables here. A friend made a high quality linear powersupply (not switching) from a big transformer, high speed rectifiers and high speed capacitors. 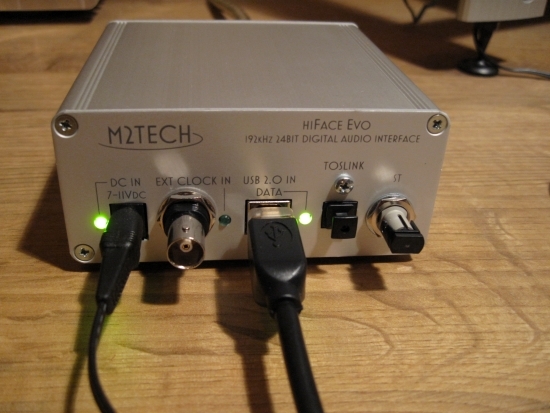 This beefy powersupply was used with the HiFace with excellent results. There are aftermarket powersupplies available from several brands, I suggest to shop around, the divident pays! This little outboard interface is the first to really challenge my EMU 1212M PCI card not only on technical aspects like resolution and openness but also on musical grounds. What remains is the importance of the computer that is used as a source. As before, a laptop sounds thinner and less musical than a big computer. No matter how you use the EVO though, I can really recommend it. What’s more: I will have to buy one myself too! Update may 2011: I have one in permanent use and haven’t heard competing devices that completely better the HiFace EVO’s performance yet. I used a regular PC (Intel core2 6600 2,4ghz) running Windows XP professional but with a very good Emu 1212M soundcard. The playback application is routed directly to the soundcard driver without going through kmix and such. 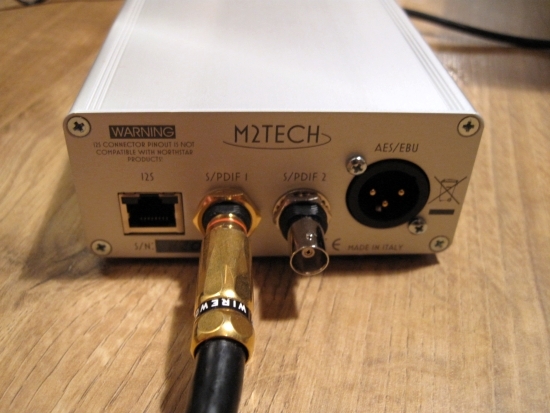 Its spdif digital output goes via uninterrupted Belden RG59 coax cable straight into the dac. This computer has been used like this in combination with many other dacs so circumstances were predictable. Do you still use the above converter? I like the sound of Classic Philips and Marantz CD, which streamer, (converter from computer) is the closest? My DAC is Lampizator Level 4.